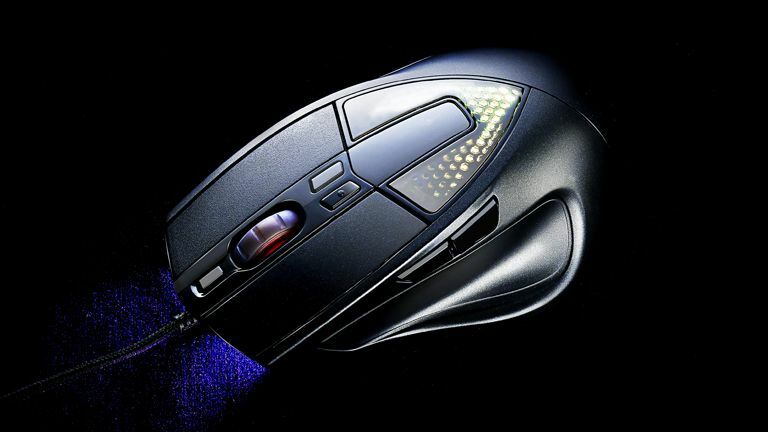 In one of the latest gaming mice releases of 2015, Cooler Master has brought another palm grip orientated mouse to the battlefield, augmenting its rodent line-up with the Sentinel III. The Sentinel III sits toward the top of Cooler Master's range of mice, however in the middle of the market in terms of price, with a large feature set delivered for a middling £39.99. Cooler Master has pedigree in this mid-tier price point market, as we saw recently with the Mizar, so we were keen to see just how the Sentinel III could perform. The Sentinel III comes equipped with an Avago S3988 Optical Sensor capable of up to 6400 DPI with four step increments, 8 OMRON micro switched buttons, an in-built variable weight system allowing adjustment between an additional 4.5g and 22.5g, an internal 32bit ARM processor with 512KB of memory, a top-mounted OLED display which can present information, logos and profiles, a matt black UV-coated plastic/rubber case with thumb rest and a two-point lighting system capable of the classic 16.8 million colours. In addition, the Sentinel III sports a lift-off distance of under 2mm, a tracking speed of 200 IPS/50g and a polling rate of 1000 Hz. Without any of the additional weights installed, the mouse weighs in at 155 grams and measures in at 135 x 83.6 x 40 mm. The mouse comes packaged in a black top-access cardboard box with front swing-door viewing window. The first thing we noticed with the Sentinel III is just how nice the matt finish is on the mouse's casing. It's black but has specks of chrome in it that really give it a pleasing aesthetic presence on the desktop. It feels good too, with the plastic's rubberised UV coating making the chassis feel soft under the skin. In terms of design shape, the Sentinel is also pleasing, boasting a long off-standard design that starts narrow at the front, with a bunch of sharp, aggressive angles, only to taper outwards at the rear into a much wider and more curved unit with gentle lines. The V-shaped top-mounted light point and OLED screen are also nicely integrated into the overall unit too, with a series of miniature hexagons creating a lattice-style pattern in the former, and a recess adding some cool-factor to the latter. The Sentinel III's scroll wheel is standard, neither feeling cheap or premium, but is neatly slotted in between three of the mouse's 8 buttons. Each of the Sentinel III's buttons feels well placed on the chassis and actuate well. At this juncture we should note that the Sentinel III's Storm-TX button, which is located on the upper left of the chassis, allows each button on the mouse to be switched to an alternate usage (programmed by you), effectively taking the overall button count from 8 up to 15. We guess most users won't need the full 15 but it is nice to have the option in the armoury so to speak. The Sentinel III's weight system is located at the bottom rear of the mouse, with a plastic panel clipping out to reveal five 4.5-gram weights embedded in a tough foam. These little weights pop out easily and let you alter the weight of the mouse quickly and without fuss. We tend to gravitate towards the heavier end of the scale with gaming mice, so kept 4 or all 5 in most of the time. If you like a really light mouse however, then the option is there to strip them right out (the Sentinel III, even without any weights, is not the lightest mouse around though). In terms of tracking the Sentinel III was very smooth, however not as smooth in our eyes as the Mizar, which really knocked it out of the park. Accuracy was good too, although again we couldn't really distinguish it from some other top gaming mice we have tested recently. If you are a pro gamer however then maybe you will. Overall however, the Sentinel III performed really well for us in a variety of games and also offered a very solid browsing and photo-editing experience over an extended period. In fact, where the Sentinel III really hits a home run is in its ergonomic comfort which is really, really pleasing. Cooler Master has come up with yet another incredibly comfortable palm grip casing and it is a pleasure to use. You want a fat feature set in your gaming mouse. You are a palm grip gamer. You prefer claw or fingertip grips. You don't like rubberised coatings on mice. You're loaded and want the absolute best tech on the market. A redesigned mouse wheel and front light point duct. We're not sure what's going on at the moment in the mid-price gaming mouse market, as we are seeing mice delivered frequently with more and more features that, only a couple of years ago, were the exclusive domain of the high-end alone. Whatever the cause though, the only winner is the gamer, as they are being brought more options and greater feature sets at lower price points. The Sentinel III does not buck this trend, delivering a really impressive set of specifications and features for a very attractive mid-tier price point. The tracking is smooth, the feature set large and the comfort - providing you are a palm grip user - super high. 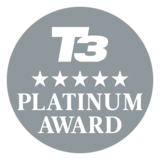 We've tested a lot of mice this year at T3.com and, without doubt, the Sentinel III is one of the ones we've liked the best. That ridonkulous feature set alone is enough for us to overlook the odd design disagreement with Cooler Master any day. The Sentinel III Gaming Mouse is available from mid-December 2015 and is produced by Cooler Master.